Explain the concept of intervention. Describe the interventions which have been used in an organization you are familiar with. Give reasons for using them. The term intervention refers to all the planned programmatic activities aimed at bringing changes in an organization. These changes are intended to ensure improvement in the functioning of the organization- in its efficiencies and effectiveness. The changes are brought through the employees in the organization while consultants facilitate the change process. Any OD intervention, therefore, involves close interaction between the consultants and the client organization. Intervention basically refers to an intended activity to bring change in the organization and the consequent activities within the organization. The intervention can be brought by an external consultant who acts in consultation with the client members. A member with in the organization, acting as the in-house consultant can also make the intervention. The organization itself could plan the intervention without employing either an internal or external consultant. Where a consultant is employed, any intervention is a collaborative activity between the client and the consultant. Where does an intervention take place ? An intervention can take place at the task, process, and system levels and their interface or at any hierarchy levels of an organization. For example it can be at a task level as to how a decision is made or at the level of a series of tasks to improve their interconnectivity, to identify an underlying problem or at a team level to create a better synergy at work. The intervention can also relate to the whole organization as to how to achieve better vertical integration /horizontal integration among all the different levels. Organizations need to basically analyse where, how, when what etc. , to carryout an intervention to improve their performance, which in other words, refer to ‘intervention strategy’. Interventions are carried to improve an organization from its current position to a desired position and to achieve the desired change a number of techniques are used. To quote, French & Bell Jr (1994), “ intervention are sets of structured activities in which selected organizational units (target groups or individuals) engage in a task or a sequence of tasks where the task goals are related directly or indirectly to organizational improvement. Interventions constitute the action thrust of organization development; they “make things happen” and “what is happening”. As suggested above a number of interventions can be carried out. They may be classified as to their focus and purpose and the intensity or depth. The focus of intervention could be : individual, interpersonal, group or team(intra and inter-group), system or subsystem, organization and the external environment. The purpose of intervention could be to improve the process (for ex. Process reengineering) Action (ex. performance), and provide feedback (ex. Has the system produced the intended results?). • To provide feedback about task, individual, team and other aspects of organizational dynamics. • To bring constructive and desirable changes to improve individual and organizational performance. Our organization ECO-CARE AND AWARE is a non profit organization providing training and support service to Developmental Sector. Support services includes planning and formulation of developmental projects, technical support during implementation, Monitoring & Evaluation, Training and Capacity Building, Research & Study, Micro Planning & PRA (Participatory Rural Appraisal).The organization caters its best services for the judicious use of Natural, Human and Physical resources. Most frequently used interventions in our organization are : person focused, role focused, action research based, process feedback based and training based. • Who does the intervention? –Individuals themselves, a group or organization, or facilitators. • What is the theoretical basis or school of thoughts? Depending upon one’s theoretical approach could be Psychoanalytical, transactional analysis, Operant Conditioning and behaviour modification, Achievement Motivation, Sensitivity analysis or t-group, field forces and group dynamics, socio-psychological and anthropological approach to role theory. • Who takes the active role- person himself or the consultant / facilitator? Pareek 1998 classifies the intervention mechanisms/techniques. Team Intervention : OD interventions are the techniques and methods designed to move an organization form ‘here’ to ‘there’ or ‘from where it is’ to ‘where it want to be’ the interventions are aimed at improving individual and team activities and efforts so that they may better accomplish their targets/ goals in accordance with the organization’s envisaged vision and strategy. The interventions also assists to change the culture of the organization. Work teams exert influence on individual work behavior. In turn, individuals also influence. OD is concerned with the different types of techniques or interventions that contribute to “team effectiveness”. Most important single group interventions on OD are team-building activities, the goals of which are the improvement and increased effectiveness of various teams within the organization. 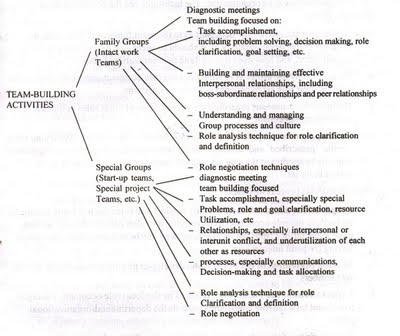 The interventions focus on different types of groups: those that are more enduring and more permanent such as the role-set (superior-subordinate and colleagues), the others which are created for a specific purpose and hence are less enduring (such as specific task teams constituted to facilitate mergers, acquisitions or organizational restructuring). 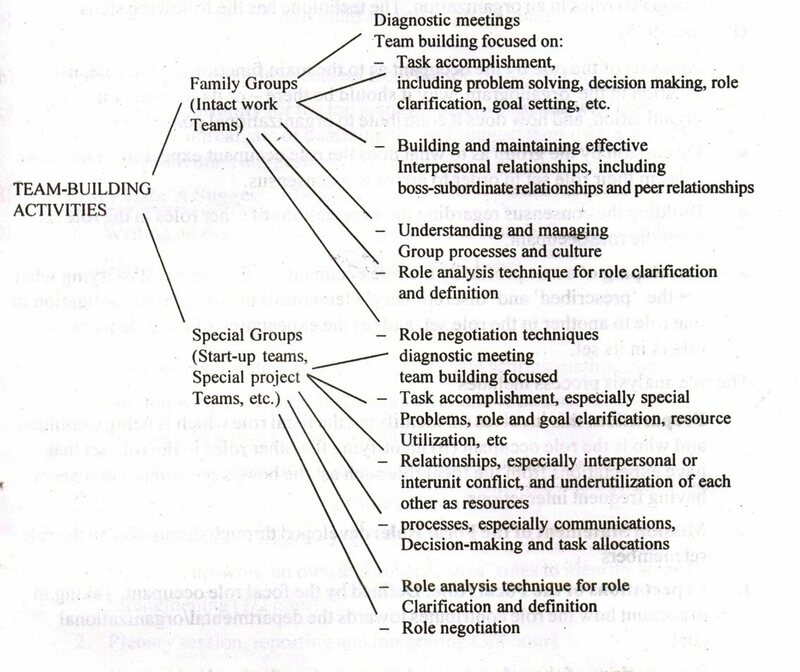 The team building interventions are typically directed towards foru major substantive areas : diagnosis, task accomplishments, team relationships and team and organization processes. These aim at bringing / improving the compatibility between a job incumbent and the role demands and expectations associated wit his / her job. • What the role is supposed to achieve ? • How the role contributes to the achievement of the group/department/unit goals ? • How the goal is related to other roles in the department and in the organization. • Discussion by the group as to what does the role occupant expect from the other roles in their role set in order to arrive at a consensus. • Building the consensus regarding the expectations of other roles in the role set fro the role occupant. • Developing of role profile by the role occupants of their roles, classifying what are the prescribed and discretionary elements of the role, the obligation of one role to another in the role set and the expectation of this role from the others in its set. Role Efficacy Lab : Role Efficacy refers to the psychological factor underlying role effectiveness and the potential effectiveness of an individual occupying a particular role or the potential effectiveness of a role. Role Efficacy Lab (REL) used to develop work commitment. • Sharing of thoughts and of individual as well as group commitments with the top managemtn. • Providing an opportunity for the top management to examine why certain expectations are unrealistic or unattainable, and suggest their won action plans taking to account other suggestions. Any change implies movement-movement towards something or away form something. Force field analysis enables listing, discussing, and evaluating the various forces for and against a proposed change. The analysis includes identifying the driving forces- which give change momentum, and restraining forces- which inhibit change. Force field analysis helps us to look at the big picture by analyzing all of the forces impacting the change and weighing the pros and cons. By knowing the pros and cons, we can develop strategies to reduce the impact of the opposing forces and strengthen the supporting forces. • Identifying a ‘common enemy’ (another group that both groups dislike, which brings the groups closer together). • Rotating the members of the groups and instituting some forms of training. The central theme of these interventions is learning through an examination of underlying process. In Process consultation, which is generic to OD intervention, the focus is exclusively on the diagnosis and management of personal, interpersonal, and group processes. Third-party peacemaking focuses on interpersonal conflict and the dynamics of cooperation and competition among groups. Sensitivity training typically yields learning’s about self, interpersonal relations, and group dynamics. Transactional analysis (TA) can be a form of psychotherapy. TA has also been used as a technique for team building. Behaviour modeling is a training technique designed to increase the effectiveness of the problematic interpersonal situations. Life-and career planning interventions are less process oriented than the other interventions and reflect more a systematic approach to a substantive area. Process Consultation Intervention : Process Consultation (PC) is a method for intervening in an ongoing system. In this approach, a skilled third party (consultant) works with the individuals and groups to help them learn about human and social processes and learn to solve problems that stems from process events. This is an often used approach by many OD consultants and practitioners. The process consultant helps our organization to solve its problems by making it aware of organizational processes, of the consequences of these processes and of the mechanisms by which they can be changed. It is to enable the organization to address its problems by itself. In this the consultant works with the organization, in work teams and helps them to develop the skill necessary to diagnose and solve the process problems that arise. The organizational processes that are important to be dealt with, include- communications, clarifying the roles and functions of group members, group problem solving and decision making, group norms and group growth, leadership and authority, and inter-group cooperation and competition. Sensitivity Training Laboratories : A T-group is an unstructured., agenda less group session for about 10 to 12 members. A professional “trainer” acts as a catalyst and facilitator. The data for discussion arises from the interaction of the group members as they strive to create a viable society for themselves. What are discussed and analysed etc are the actions, reactions, interactions and feelings arising out of the member interactions. Conceptual material relating to interpersonal relations, individual personality theory, and group dynamics also form a part of the program. The ‘group experiences’ form the fulcrum of learning. This T-group is a powerful learning laboratory facilitates learning more about oneself as a person, learning how other reacts to one’s behaviour, and learning about the dynamics of group formation, group norms and group growth. It assists to improve one’s interpersonal skills. These insights are coupled with growth of skills in diagnosing and taking more effective interpersonal and group actions that provide the participants the basic skills necessary for more competent action taking up in the organization. The confronting meeting : The confronting meeting, developed by Richard Beckhard, is one-day meeting of the entire management of an organisation to take a stock of the organizational health. In a series of activities, the management identifies the organisation’s major problems, analyzes the underlying causes, develops action plans to correct the problems and sets a schedule for the remedial work. The confrontation meeting is a quick, simple and reliable way in which to generate data about an organisation and to set action plans for organizational improvement. Strategic management activities : Strategic management refers to the development and implementation of the organisation’s “grand design” or overall strategy in relation to its current and future environmental demands. According to Schendel and Hofer six major tasks comprise the strategic management process : 1) goal formulation; 2) environmental analysis 3) strategy evaluation 4) strategy implementation and 6) strategic control.” These six components of the process are related to each other. This refers to intervention or change efforts aimed at improving organization effectiveness through changes in the task and structural and technological subsystems. This class of interventions includes changes in the division of overall work of the organization into units, reporting relationships, work flow and procedures, and role definitions, methods of control, and spatial arrangements of equipment and people, etc. Job design : job design refers to the way that a set of tasks, or an entire job, is organized. Job dsign helps to determine : What are the tasks done, how they are done and what is the order in which they are done, etc. It takes into account all factors, which affect the work, and organizes the content and tasks so that the whole job is less likely to be a risk to the employee. Job design involves administrative areas such as : job rotation, job enlargement, task/ machine pacing, work breaks and working hours. A well designed job takes into account the basic principles of ergonomics that will encourage a variety of ‘good’ body positions, have reasonable strength requirements and reasonable amount of mental activity. A well designed job also contributes to feelings of achievement and self-esteem. Job design principles can address problems such as : work overload, work under load, repetitiveness, limited control over work, isolation, shift work, delays in filling vacant positions, excessive working hours and limited understanding of the whole job process. Job design also assists in minimizing job stress. MBO is essentially based on a very simple facts- wherever people work in an organization together there will be a wide variety of objectives. Each individual has his or her own personal goals (e.g. better working conditions, better training, better pay); each department has its own business targets ( higher output, better equipment, more funding) and the top management, too has its own strategic aims (organizational success, corporate identity, corporate image). MBO is the art of getting all these varied interests to correspond to one common goal. Talks can also be conducted collectively with the departmental teams. The main object of MBO is to make the individual goals voluntarily coincide with the goals of the organization. MBO only works when management and staff agree to support mutual goals in an atmosphere of confidence and trust, commitment and motivation. The concept is based on on the assumption that employees are, by nature, willing to perform. MBO succeeds where there is a dialogue on objectives between the employees and the management founded on fairness and clarity. Maybe you could write next articles referring to this article. I wish to read even more things about it! We cherished your site. Significantly thanks once again. Much obliged. I am taking the Internet seriously now. Textile blog. I can unburden that i desire come here again. Homelessness to see more topics to talk. I am the proud owner of my own website and blog and i get ideas from blogs such as yours. Hi it's me, I am also visiting this site daily, this site is actually fastidious and the viewers are in fact sharing nice thoughts. Usually when I find stuff like this I stumble it. out for frequently current material on photography magazine.